Although it is not on the coast, the village of Bella Coola, British Columbia, has the distinction of being on salt water. A sport fisherman's dream, this village is located in the strategic position where the Bella Coola River joins with the salt water of the Pacific. A great many adventures and sights open up to those who find their way to this western terminus of Highway 20. Bella Coola serves as a major port between Vancouver, BC, and Prince Rupert. At any time the port will be host to anything from fishing boats to pleasure craft travelling BC's Centra Coast. Canneries, log sorting and loading sites and tidal flats are all located in the port area along with facilities such as a restaurant. This area was first settled because of the trade in oolichan grease for furs, hides and tools from inland. In the late 1800s, Norwegians established Hagensborg just east of Bella Coola, in the Bella Coola Valley. The communities of Bella Coola and Hagensborg share a number of facilities, accommodations and services. Tweedsmuir Provincial Park, to the east of Bella Coola, provides a wilderness setting for a number of outdoor adventures including hiking the Alexander Mackenzie Heritage Trail. (contact BC Parks for more information). The nearby communities of Bella Bella, Shearwater and Ocean Falls can be accessed by water to explore British Columbia native culture, experience kayaking and explore numerous inlets and waterfalls. 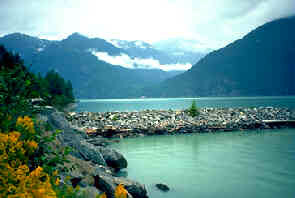 Access: Bella Coola, British Columbia, can be accessed by land or by water. This scenic 440 km (272 mi.) trip across BC's Chilcotin Country from Williams Lake (1,000 km from Vancouver) becomes quite spectacular when you drive the steep hill into the Bella Coola Valley. "The Freedom Road" as it once appeared. The Hill: The famous Bella Coola hill is the point on Highway 20 where the Coast Mountain Range begins and the descent into the Bella Coola Valley starts. At Heckman Pass - the highest point - drivers reach an elevation of about 1524 m (5000 ft.). Approximately 30 km (20 miles) of winding, narrow, unpaved road precede the hill. 'The Hill' itself consists of one 10 km (6 mile) stretch of switchbacks, with grades to 18% in that section. 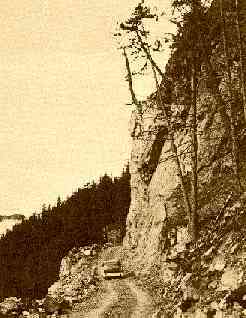 The Hill was once called the "Freedom Road" because it provided a route out of the Bella Coola Valley. In the 1950's, the provincial government refused to build this section of the road, so valley residents built it themselves. Outsiders said it couldn't be done, but on Sept 26, 1953, two bulldozers - one pushing east, the other pushing west - actually met. The steep incline and hairpin turns afford a panorama view of the changing scenery of mountains and valleys. Commercial air service is available to the airport in Hagensborg, but charter airlines will fly to most areas.